Barry Murphy; Simon Madden, Lee Desmond, Kevin Toner, Ian Bermingham; Jamie Lennon, Owen Garvan; Conan Byrne, Ryan Brennan (Graham Kelly 70), Dean Clarke (James Doona 74); Jake Keegan (Christy Fagan 60). Aaron Dillon; Hugh Douglas, Conor Kenna, Sean Heaney, Andy McGovern; Paul O'Conor, John Sullivan (Dan McKenna, 63); Daniel Kelly (Cory Galvin h-t), Darragh Noone (Jake Kelly h-t), Aaron Greene; Gary McCabe. First league goals for the club from Jake Keegan, who scored twice, and Kevin Toner helped ease St Patrick's Athletic to their biggest win of the season over hapless Bray Wanderers in their SSE Airtricity League Premier Division clash at Richmond Park. The victory moves St Pat's up to fifth place, overnight at least, as Bray remain in big trouble, rooted six points adrift at the foot of the table. St Pat's manager Liam Buckley went with the same starting eleven that was unfortunate to get nothing from a 2-1 defeat at Derry City last week. 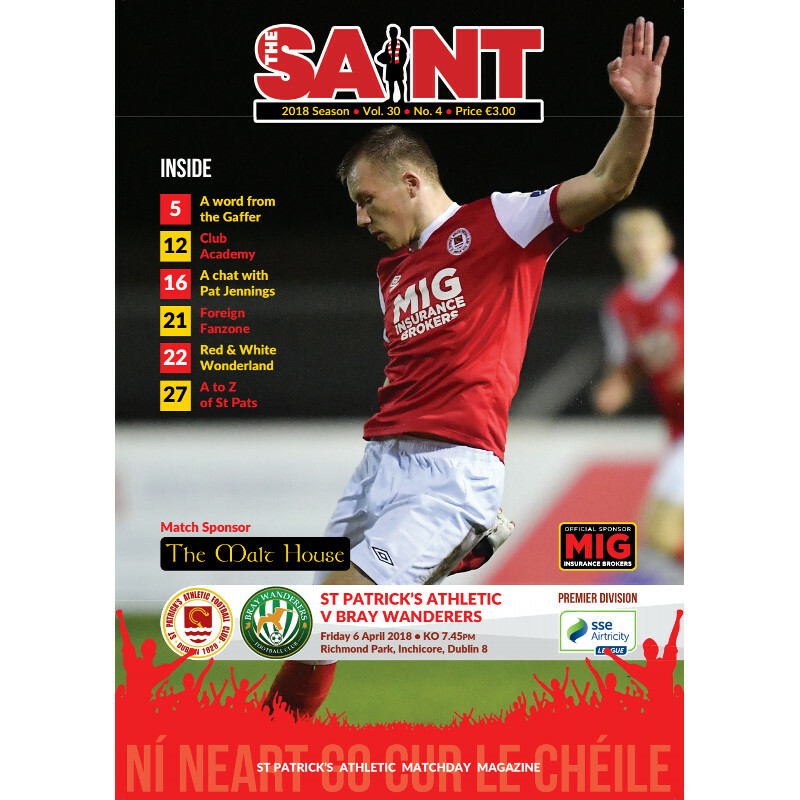 Taking the positives from that display, St Pat's were on the front foot from the off as Simon Madden drove a fifth minute shot wide across goal from skipper Ian Bermingham's cross. And it was little surprise their early dominance paid off for the Inchicore side who were in front 12 minutes later. Owen Garvan and Keegan worked the ball to Bermingham on the overlap down the left. Ryan Brennan got his head to the cross with Keegan arriving to get the final touch at the far post. Totally controlling possession, St Pat's stretched their lead on 36 minutes from their fourth corner of the game. Conan Byrne delivered it deep into the area where central defender Toner met the ball with a meaty header, a defender merely helping it on its way to the net. It was 3-0 four minutes before the interval. Conor Kenna upended Dean Clarke inside the area. Byrne blasted the resultant penalty down the middle with the ball deflecting into the roof off the net off goalkeeper Aaron Dillon's legs. Making two changes for the start of the season half, Bray came a little more into the game. But service soon resumed for St Pat's as they extended their lead on 58 minutes. A sublimely weighted through ball from Garvan played Keegan in behind the Bray defence and he finished emphatically with a rising right-foot shot to the net. Three minutes later it was 5-0. Another excellent through pass, this time from Jamie Lennon, played Clarke through. The winger calmly took the ball round Dillon before sliding it to the net.